A low cost and easy to build smart mirror with off the shelf parts. Lots of bargains for buying used. Try to make sure the ports are pointing down (parallel to screen) instead of out (perpendicular) to make wall mounting easier. 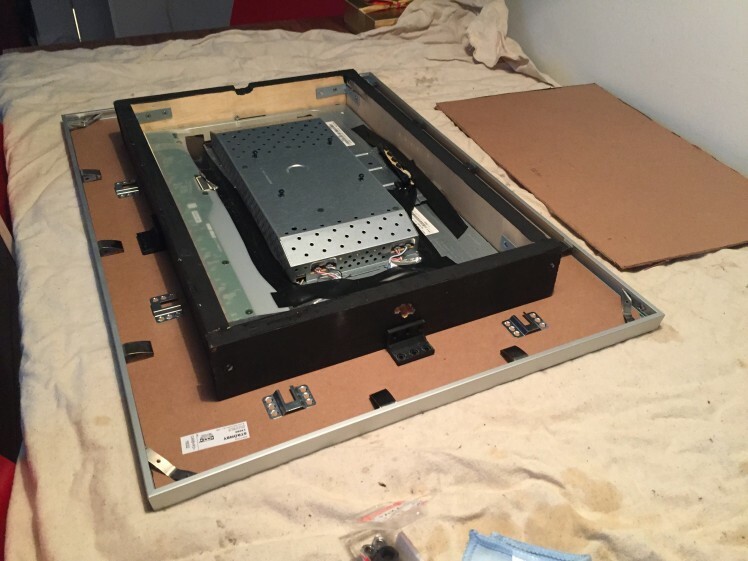 Chassis - Steel 12" x 8" x 3"
Simply require lumber to build case around monitor. You can go off script here. Any 90 degree angle bracket less than 2" in length should work. 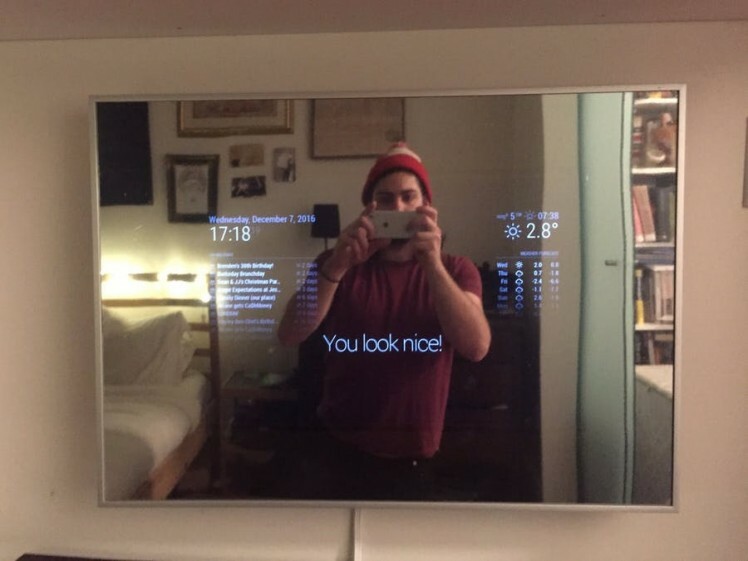 This Smart Mirror build is aimed at being low cost, and made from readily available parts. 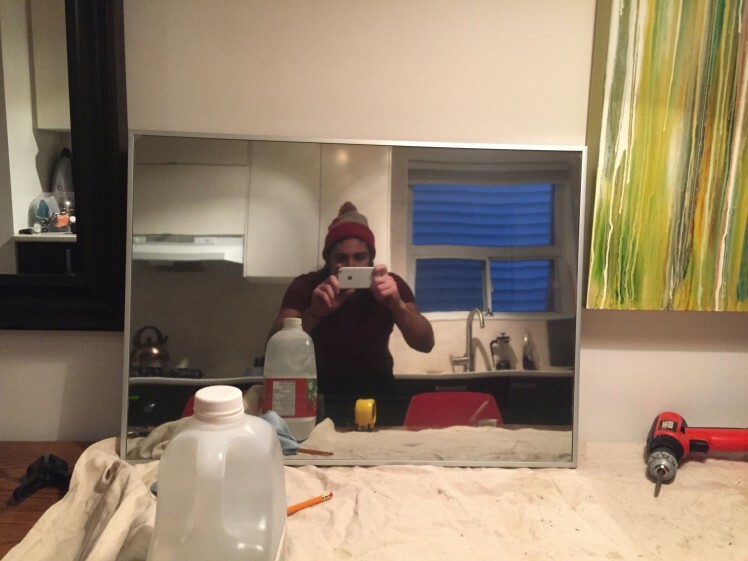 It all relies on the use of a regular picture frame, and mirrored window film to turn the glass into a two way mirror. Then you enclose a monitor in a wooden frame, and attach the monitor to your mirror. Finally, you get the software running on a raspberry pi, and put it behind the monitor. This project also includes a bonus Alexa installation. 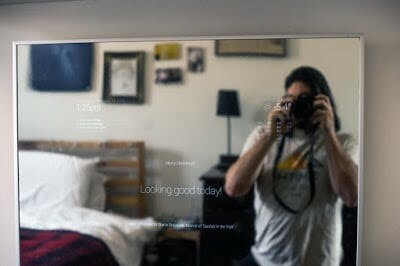 Your smart mirror will be great without this, but it's nice to have a voice assistant in your mirror to ask tough questions or control home automation. Fill the squirt bottle with water and add about 0.5 tablespoons of dish soap. Basically just one squirt. Cut off a piece of reflective film about 1 inch larger than your surface in all directions. Clean your surface, and then spray generously with dish soap mixture. Put scotch tape on both corners of the film, and pull it apart to remove the plastic protective liner. Peel the liner, spraying dish soap mixture between protective liner and the film sheet. With the film sheet generously coated in soap mixture, lay it flat on your surface. Squeegee down the middle, and then from the middle out to the sides. Keep spraying and smoothing until all the air bubbles are gone. Use scissors or the exacto knife to trim excess materials from edge. You're done! Let it sit for a while before moving, as it hasn't really stuck in place until all the soap mixture dries. The goal here is to get 4 pieces of wood around your monitor. 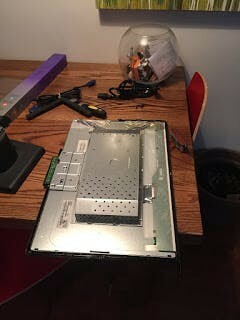 Start by removing the monitors bezel by removing screws and jabbing a knife or paint scraper in the seam of the monitor. If there are loose monitor controls, cover the exposed backside of the circuit board with electrical tape, and tape it to the back of your monitor. Now it's time to build the frame. Use your most basic woodworking skills to size the wood frame, and then use the 90 angle brackets to attached the inner corners. Then screw 4 small screws in the front and back corners to hold the monitor in place. 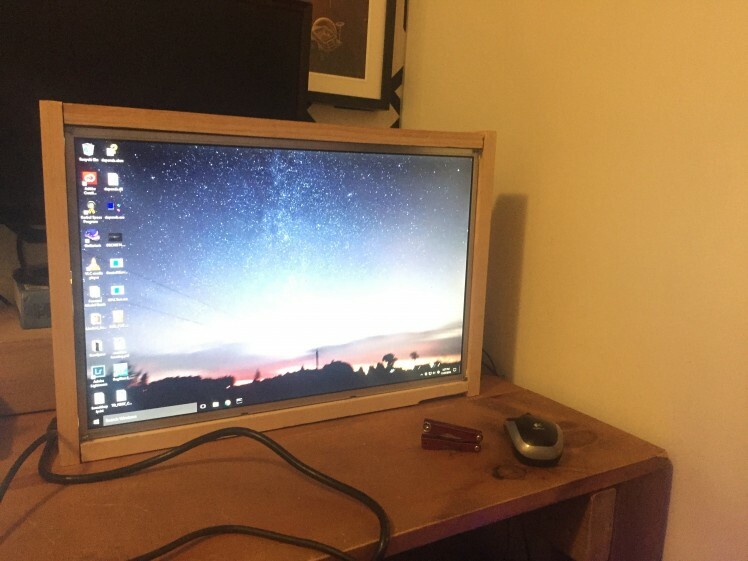 Monitor with wooden enclosure. Actually looks pretty cool on its own. Note, I painted the frame black shortly after this for aesthetic purposes. 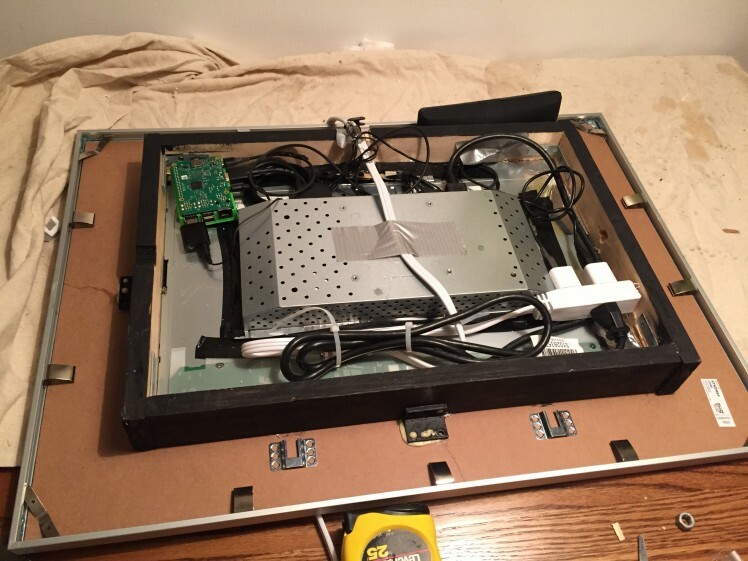 We have our ikea frame mirror, and a wooden monitor enclosure, and we need to stick them together. I did this by cutting a hole with in the rigid frame backing of my Ikea frame, and gorilla glued some angle brackets to the backing to attach to the outside of the frame. Monitor enclosure sitting in ikea frame hole with angle brackets ready to be glued. The hole in the frame backing was done using multiple passes of an exacto knife. Then I lay the monitor flat over the hole, centered everything, and used the all surface gorilla glue to fasten 4 angle brackets around each edge. My electronics in place behind the monitor. You should also follow these steps to enable VNC Viewer, a remote desktop tool that allows to you access your RPi desktop from any computer on the same network. This lets you work remotely once you've finished the initial setup, without plugging in a keyboard and mouse. With the basic setup done, we will now install the core application called MagicMirror. There is a guide on the website to install MagicMirror, but it didn't entirely work for me. This should show the default mirror dashboard which you will immediately want to customize. To edit this, navigate to the MagicMirror/config/config.js file and add custom location, calenders, moldules, etc. There are also some additional configuration details regarding screen orientation, screensaver settings, and wifi. If you've already got a computer on your wall, you may as well add some voice interaction. This can be done by installing and running Alexa on your raspberry pi as well. Instructions for this can be found previous post. Alexa and MagicMirror will then run simultaneously on the same raspberry pi (at about 25 - 50% CPU). Congratulations, now you've got a smart mirror, and maybe a personal assistant! Have fun never looking at your smart phone again. If you'd like to add some custom behaviour to Alexa, checkout this post on how to do it. I like to make projects that are beginner to intermediate in difficulty, with the hope of encouraging new makers to try something out for the first time. There are lots of opportunity for pretty exciting outcomes with only one or two days work. I have a mixed background of physics and computer science as well, so I like to work in a little science to my projects when I can.